South Park Reel Chaos, an online video slot released by Net Entertainment, comes loaded with lucrative features such increasing multipliers, stacked wilds, free spins, and bonus games. 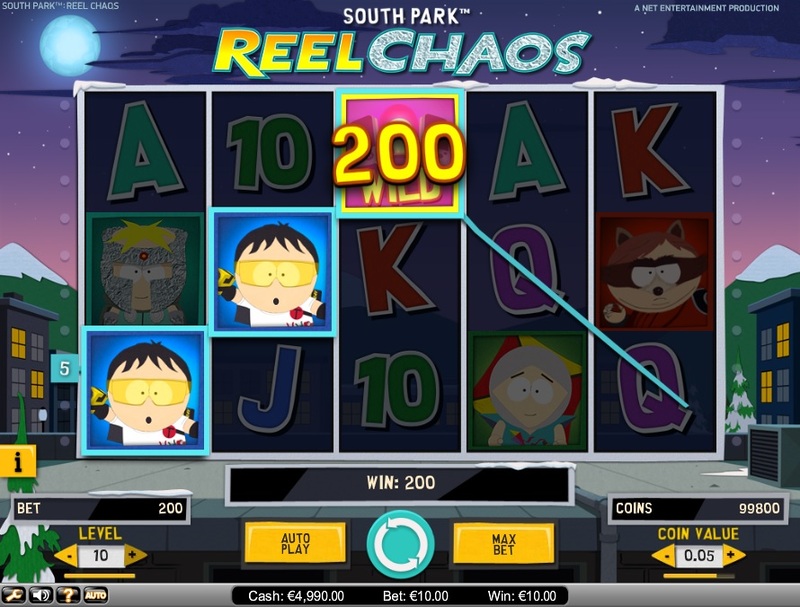 Net Entertainment’s South Park Reel Chaos has 20 fixed paylines, eliminating the need for players to activate paylines they would like to play. However, players are given the option to bet anywhere between one and ten coins per payline. They can also choose from coin values such as $0.01, $0.02, $0.05, $0.10, $0.20, and $0.50. Players can therefore bet as little as $0.20 and as much as $100.00 per spin of the reels. The slot comes with an Autoplay feature, which players can use to automatically spin the reels for a certain number of games. Players can also alter the game settings as per their wish. If players have any questions, they just have to click on the question mark symbol at the bottom of the game. A sequel to South Park, NetEnt’s South Park Reel Chaos is based on the same sitcom theme, except that all the four friends now return as superheroes. The friends, who are all from fourth grade, fight to save their city from Prof. Chaos and his evil minions. The reels feature familiar symbols of Cartman, Stan, Kenny, Prof. Chaos, and Kyle, along with high-value card symbols. South Park Reel Chaos has three wild symbols, which can appear on any reel during Stan’s multiplying re-spin and the base game. It can help players to complete any winning combination by substituting for all other symbols except the bonus symbols. The Cartman symbol appears stacked in the base game, but this feature gets activated at random. If Prof. Chaos and Kenny get into a fight during a spin, something that happens at random, players can win multiplier values of up to x5. Stan’s Multiplying Re-spin is another feature that can get randomly activated at the end of a spin that doesn’t result in a win. During this feature, the reels are re-spun till players win. Every times the reels re-spin, players get an increasing multiplier value of up to x10. The Kyle’s Overlay Wilds feature can also get randomly activated in the base game. When this happens, Kyle clears all evil minions from the reels and creates up to 5 overlay wilds. Whenever players spin at least three bonus symbols on the first, third, or fifth reels, the Mintberry Crunch Epic Bonus Spins get activated. Mintberry Crunch fights against a maximum of four enemies. If he defeats them all, players will get a victory bonus. The multiplier value increases up to x4every time he defeats an enemy. South Park Reel Chaos is available for fun and real money at any NetEnt-powered online casino.